A Complete 3D editor for the price of a Plugin! A multi level 3D system for the development of games, Poser Content and Animation. Ogre / Blink export - currently writes .mesh and .skeleton with auto compile to biniary and .material files. Fully animated, Progressive mesh and manual LOD supported. Auto generate game levels from 2D plans, straight and spiral stairs, column arrays. Merge multiple models and textures into a single mesh, texture and uv set for game exporting! 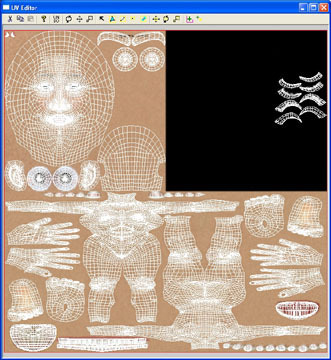 For Poser - reads all Poser files, writes Poser morph obj files, pose files, new cr2 files, conformed cr2 files. Create new Poser content from scratch. ToolBox includes the Poser joint deformation system so models bend the same in ToolBox as they do in Poser! To keep with Greenbriar Studio's tradition of free upgrades on such a large and complex piece of software, ToolBox will be offered at various levels. New levels will be released as major components are completed. Each level is a subset of the same code base, so bug fixes and improvements will always be available to all levels, they won't get outdated by new releases. Buy only what you need and know that it will keep being updated even when new levels are released. Level I is an editor designed to build game levels. It has all geometry editing tools, auto geometry generation tools, single set uv mapping tools, image handling, materials, terain generation. Import and export game levels, obj files and terrain. Does not include animated game models. Level II is for Poser content creation. It adds a complete FK animation system consisting of a professional morph system that can handle thousands of morphs (by the author of the LightWave 8 morph system). Supports Parenting objects to bones, Poser style conforming. 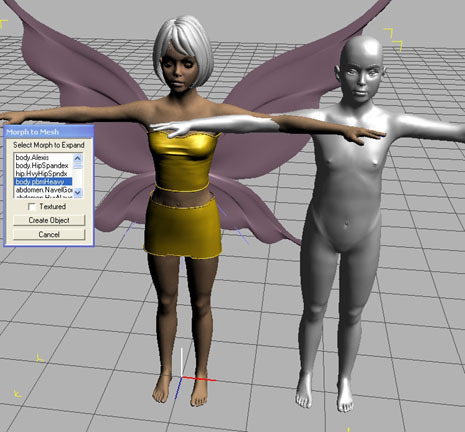 Import and export to Poser file formats. Adds multi uv set capability to the the integrated uv editor. Includes morph and bone creation tools. Does not include game level or model tools. Now available. Includes ToolBox I and II plus. High end rendered output for cut sequences, subD surfaces, animated cameras, Apple QuickTime interface and lots of other goodies. Multi weight bone system, plus Poser bone system, vertex animation system, read and edit md2 and other vertex based animated models or convert bone and morph based animations to vertex and then edit! 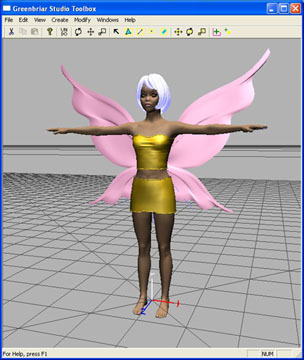 Import and export to animated game model formats and Poser file formats. And the ability to merge multiple textures and uv sets into a new single texture and uv set for game model exporting. 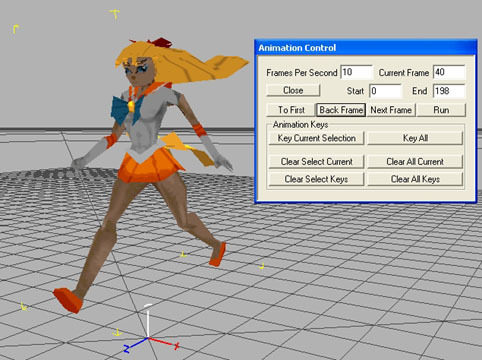 Aimed at making game cut sequences, stand alone animations, animated game models, Poser content, bvh import and export. Now with Torque and Ogre game exporters, Progressive Mesh system and IK. Now available. ToolBox Pro with feature film Acclaim MoCap import/export and bvh to Acclaim. Import, edit and export Acclaim animations. Built to maintain file ordering necessary to be Massive compatible. Includes ASF import/export, AMC import/export, import bvh to an asf skeleton for export as asf/amc. Adds dynamic systems, gravity and wind along with dynamic Hair, Cloth and Particle system. 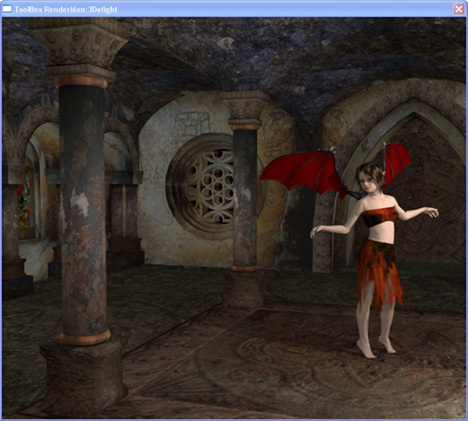 The addition of sound that plays back synced to the animation, and many features to allow using the OpenGL display system to create movies at almost realtime, which can then be played back inside ToolBox for viewing your animation real time (for scenes too big to play real time in the ToolBox editor). Real time Shadows, antialiasing and depth of field allow you to create useable animated movies at almost real time. Plus built in support for our new GRRen product, our own Renderman (Renderman copyright Pixar) compatible renderer. Also Animated Camera Switching - switch cameras for multiple shots in the same animted sequence! 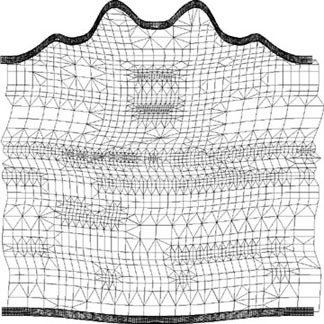 Joint Controlled Morphs moves morphs based on the movement of bones. Creates auto morphing in your models. And new Render output formats - Tiff with Alpha, JPG and OpenEXR High Dynamic Range Image. Many changes - see updated manual! Updates to Greenbriar Studio products are free. The cost to upgrade to more feature rich levels is the difference between the new level price and what you paid for your current level plus only a $5.00 re-license fee. Cheap to try a basic level to see if you like it! Don't pay for the same program over and over! Extra copies of ToolBox are available for only $50 for registered owners. Download the current manual to see what ToolBox can do. Demo copy of ToolBox now available. Now comes with the demo version of GRRen! A single morph made into a mesh for easy morph editing. ToolBoxIV Dynamics now shipping.The ToolBoxIV Demo with GRRen Demo version now available. Many new edit tools added with 2.0, please see manual. Check back here for updates on new sections complete and shipping and new game system and file I/O updates. We're working through a long list! Please feel free to request additions to ToolBox, that's how this project has been designed, reacting to requests from our users. 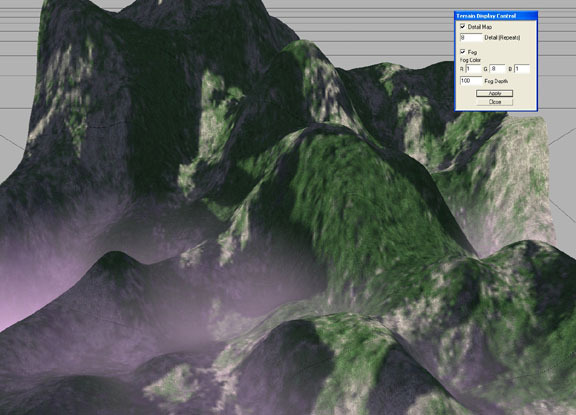 Terrain generated with one of the built in Terrain generators. Shows base plus detail texture and optional fog.